The TAE40116 Certificate IV in Training and Assessment (TAE40116 for short) is a new qualification, meaning that there is no direct equivalent to the previous TAE40110 Certificate IV in Training and Assessment (TAE40110 for short). Unfortunately, there is no mapping between superseded versions of the Certificate IV in Training and Assessment qualifications such as the superseded qualifications TAA40104 or BSZ40198 or Train the Trainer. The following information only applies if you have completed the whole TAE40110 Certificate IV in Training and Assessment qualification, you should have a minimum of 10 units of competency on your transcript. Before you continue it will be helpful for you have your transcript of results in front of you so you can work out which scenario applies to you. This page only applies to you if you want to “upgrade” to TAE40116 Certificate IV in Training and Assessment, for the full course visit our page on TAE40116 Certificate IV in Training and Assessment. The information here is only a guide, double check with your Registered Training Organisation, TAFE, or workplace for particular requirements on what the new changes may need for you. 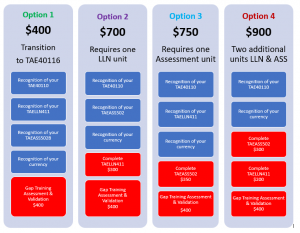 There are four possible options to transition or “upgrade” from your Certificate IV in Training and Assessment. All options will require gap training to verify industry and training currency. Technically the TAE40116 Certificate IV in Training and Assessment is not an “upgrade” but a new qualification, the use of the term is common as it is established practice for previous reiterations of the CIV Training and Assessment. It is vital to note that if you have both the units of competency TAELLN411 Address adult language, literacy and numeracy skills and TAEASS502B Design and develop assessment tools you already meet the requirements to remain current, there is no need to transition to TAE40116 Certificate IV in Training and Assessment. Before continuing, take the time to read the Minister’s latest information on TAE40116 and if you need to “upgrade”. Remember TAE40116 Certificate IV in Training and Assessment is actually a new qualification and is not technically an “upgrade”. 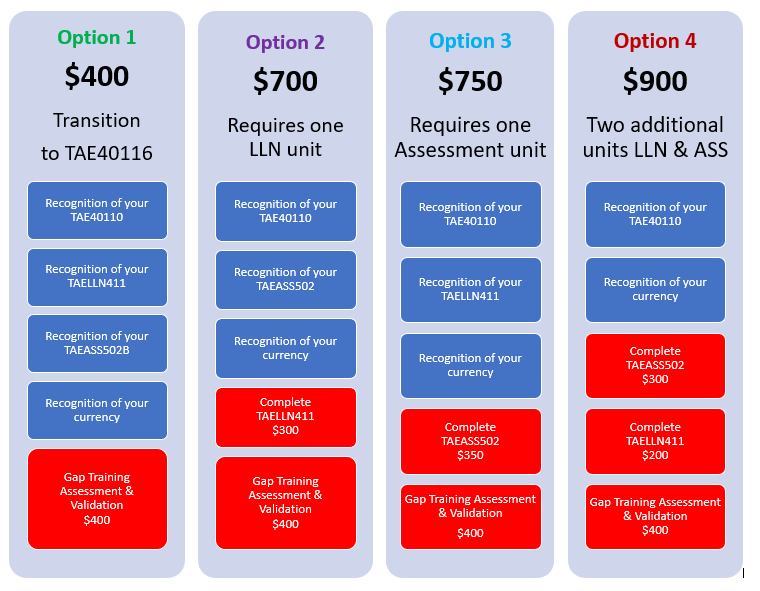 The use of the term “upgrade” while widely used in VET for students with TAE40110 Certificate IV in Training and Assessment wanting the new TAE40116 Certificate IV in Training and Assessment, will require a combination of Recognition of Prior Learning (RPL), credit transfer and gap training. Do I have to upgrade TAE40116 Certificate IV in Training and Assessment? The new TAE40116 Certificate IV in Training and Assessment options are detailed on the Minister’s page on the trainer and assessor credential requirements. For all TAE40110 Certificate IV Training and Assessment holders upgrading to TAE40116 Certificate IV in Training and Assessment is an option and is not a requirement. Depending on where you completed your TAE40110 Certificate IV Training and Assessment qualification, you will fall under 7 possible scenarios that will require either no further action, through to having to complete two or more units. If you hold previous versions of the CV Training and Assessment, such as TAE40104, BSZ, or Train the Trainer qualifications there is no mapping or transition options available, you will have to either complete the new TAE40116 or undertake a combination of RPL and completing units from the new course. There is also no mapping between university qualifications such as from secondary teaching or adult education. Have your TAE40110 Certificate IV Training and Assessment transcript and other relevant qualifications, skill sets or statement of attainments to work out which scenario applies to you. The best scenario is when you hold the full TAE40110 CIV Training and Assessment and the two units TAELLN411 Address adult language, literacy and numeracy skills and TAEASS502B Design and develop assessment tools. You may have the two units TAELLN411 and TAEASS502B as part of your CIV TAE40110 or as statement of attainments. If you fall under this option there is no need to upgrade TAE40116, you meet the new credential requirements. However, if you want to upgrade TAE40116, you will need to undertake gap training for the two new units TAEASS401 Plan assessment activities and processes & TAEASS403 Participate in assessment validation. As a requirement you will need to demonstrate how you have maintained your vocational currency. A common pattern of study is where you have the full TAE40110 CIV Training and Assessment and the addition of the Language, Literacy and Numeracy unit of competency TAELLN411 Address adult language, literacy and numeracy skills. 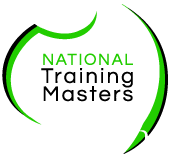 Originally in 2014 when the revision to the CIV qualification was discussed the only addition was going to be the LLN unit, however, over time the training packages was changed to include the new diploma level unit and changes to assessment units. Consequently, to meet the new credential requirements you will need to complete the diploma level unit TAEASS502 Design and develop assessment tools. You have the option to undertake gap training for the two new units TAEASS401 Plan assessment activities and processes & TAEASS403 Participate in assessment validation to upgrade TAE40116. As a requirement you will need to demonstrate how you have maintained your vocational currency. It was uncommon for the diploma level unit to be included in your TAE40110 CIV Training and Assessment qualification, but if you have this unit it is very helpful. As an elective in the old TAE40110 course, the vast majority of providers did not offer the unit TAEASS502B Design and develop assessment tools. However, it is possible that you may have the unit TAEASS502B as an elective or have completed the unit in either the TAE50111 Diploma of Vocational Education and Training or the TAE50211 Diploma of Training Design and Development. To meet the new credential requirements you only need to complete the language, literacy and numeracy unit TAELLN411 Address adult language, literacy and numeracy skills. If you want to upgrade TAE40116 you will need to complete TAELLN411 and gap training for the two new units TAEASS401 Plan assessment activities and processes & TAEASS403 Participate in assessment validation. As a requirement you will need to demonstrate how you have maintained your vocational currency. The scenario where you have the full TAE4010 CIV Training and Assessment qualification but neither the LLN or diploma level units, TAELLN411 Address adult language, literacy and numeracy skills and TAEASS502B Design and develop assessment tools is common if you completed your course between 2010 through to 2015. In the first few years of TAE40110 there was no indication that the LLN unit or the diploma level units were ever going to be included in the next version of the CIV Training and Assessment. To meet the new credential requirements, you will need to complete the two units TAELLN411 Address adult language, literacy and numeracy skills and TAEASS502 Design and develop assessment tools. If you want to upgrade TAE40116, you will also need to undertake gap training for the two new units TAEASS401 Plan assessment activities and processes & TAEASS403 Participate in assessment validation. As a requirement you will need to demonstrate how you have maintained your vocational currency. If you have completed the previous versions of the CIV Training and Assessment (TAE40110, BSZ40198, Train the Trainer of equivalent) you do not meet the new credential requirements. At this stage you will need to evaluate if it is worth applying for recognition of prior learning (RPL) or completing the new TAE40116 CIV Training and Assessment. You cannot upgrade TAE40116 from the previous versions of CIV Workplace Training and Assessment. If you hold a diploma or higher qualification in adult and VET, you currently meet the new credential requirements. There is no need to upgrade your qualifications or transition to the new TAE40116 CIV Training and Assessment. While there is no definitive list of what constitutes a diploma of higher qualification in adult education, read the guidelines from ASQA for more information and make a determination either way. Most RTOs and TAFEs will insist on having you either complete the two units TAELLN411 Address adult language, literacy and numeracy skills and TAEASS502 Design and develop assessment tools, with you holding the CIV TAE40110. Alternatively, your employer may insist you transition to the new TAE40116 CIV Training and Assessment. Unfortunately, because of confusion within the sector over the place and role of higher qualifications in adult education, it is very confusing and may not meet employment requirements. It is essential that you check with your employer on conditions of employment and specifics for what you need to complete, especially if the requirement is holding both TAELLN411 and TAEASS502 units of competency for employment. If you are a trainer or an assessor, you will have a skill set or a statement of attainment. Under the previous Training Package TAE10 there were 7 skill sets and with the new TAE version there are 9 skills sets, you may hold one or more of these skill sets or units of competency, meaning you could meet the new credential requirements as either a trainer or an assessor. You will need to double check all your transcripts to determine if you meet the new requirements, especially the unit TAEASS502 Design and develop assessment tools. You will need to determine if you need to complete one of more units of competency especially TAEASS502 to meet the new credential requirements. There is the option where some units may be eligible for credit transfer through to completing units and gap training to the new TAE40116.